Stomata are small apertures in the epidermal surface of a plant leaf, stem or flower through which gaseous exchange and water transpiration occur. 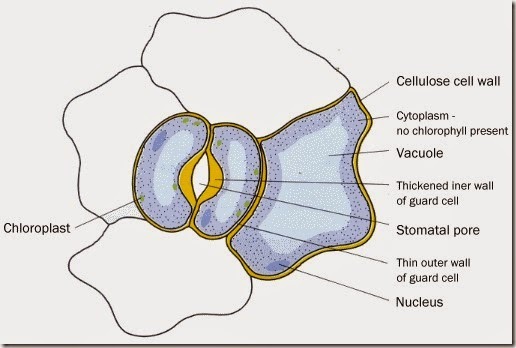 Stomata are minute apertures in the epidermis of aerial parts of the plants bounded by two kidney shaped guard cells. Stomata are absent in roots. 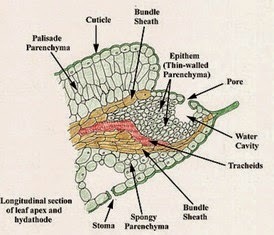 i) They may be at the same level as the adjoining epidermal cells as in most mesophytic plants. ii) In xerophytic plants, the stomata are sunken as they are located in a cup shaped depression. iii) Sometimes the stomata are slightly raised above the surface of epidermis. Hydathodes are specialized pores along the margins and apex of the leaf through which the secretion of water (guttation) takes place. Hydathodes or water stomata consists of vein endings, epithem, chamber and pores. Pore is surrounded by guard cells but it remains open permanently. 2. Guard cells always present and due to their flaccidity the stomatal pore may be closed. 3. Epithem does not present. 4. Only water comes out in the form of vapour through the stomata. No mineral salts liberated with water. 2. Guard cells always absent. The pore always remains open, and never closed. 3. Thin walled cells with intercellular spaces called epithem is present. 4. Water along with mineral (inorganic) salts are liberated thorough the pores in the form of liquid droplets.